Who will win PAK vs SA, 2nd T20I - Feb 03, 2019 ? Who will win PAK vs SA, 2nd ODI - Jan 22, 2019 ? Who will win PAK vs SA, 3rd Test - Jan 11, 2019 ? Who will win PAK vs SA, 2nd ODI - Jan 03, 2019 ? Who will win PAK vs SA, 1st Test - Dec 26, 2018 ? 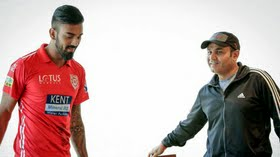 Jun 04, 2018: Kings XI Punjab opener KL Rahul came out in praise of the IPL teams mentor Virender Sehwag for the manner in which he allowed the players to express themselves. • Cricket Mania soon to be replaced by Football Mania? © 2009-2017 Cricwaves.com All Rights Reserved.